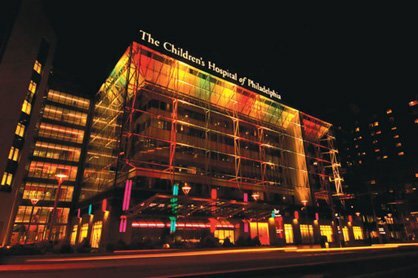 The Children's Hospital of Philadelphia. The Children's Hospital of Philadelphia is officially on the airwaves. In partnership with iHeart Media Philadelphia, the hospital on Wednesday debuted "Breakthrough Radio," a mix of happy tunes and healthy tips geared toward a family audience. Segments on the new station will include health tips for everyday life and interviews with doctors, patients and staff at CHOP. The station's family-friendly identity could catch on quickly in the Philadelphia area, where the long-running success of WXPN's "Kids Corner" has filled the niche during the 7 p.m. hour on weeknights. Breakthrough Radio is an all-day affair. Its music appears to skew a bit toward older kids, but as the station develops new programming over time, there will probably be a place for the Earthworm Ensembles and The Not-Its! of the world. Turtles – "So Happy Together"
Paul McCartney – "Silly Love Songs"
Jackson 5 – "Dancing Machine"
As the host put it: "Therapy for your mind, body and soul." Breakthrough Radio airs 24/7 on 1480 AM or 105.3 HD2. You can also stream the station here.